The vegan, vegetarian and flexitarian population of Canada has been rising rapidly of recent years, and in a recent study conducted by Dalhousie University, over 32% of Canadians are looking to reduce or eliminate meat consumption over the next 6 months. Canadian brand Yves Veggie Cuisine® has been creating delicious foods for more than 20 years and are committed to staying at the forefront of this movement. Yves launched in 1983 and offer 100% plant-based products. Their range includes over 40 ready meals and meat alternatives, such as falafel and other appetisers, burger patties, sandwich slices, and their award-winning Veggie Ground Round. The brand was voted the #1 most trusted vegan brand by BrandSpark International in 2018. Beena Goldenberg, CEO of Hain Celestial Canada, ULC who manufactures the Yves Veggie Cuisine® brand, said; “There has been a perceptible shift in thinking around vegetarian-based diets. “We see continued growth in the flexitarian category which illustrates that consumers don’t feel that they have to be 100% vegan or vegetarian. There are a lot of advantages to increasing consumption of plant-based foods including a good source of protein, no trans fats, artificial colours, flavours or preservatives. 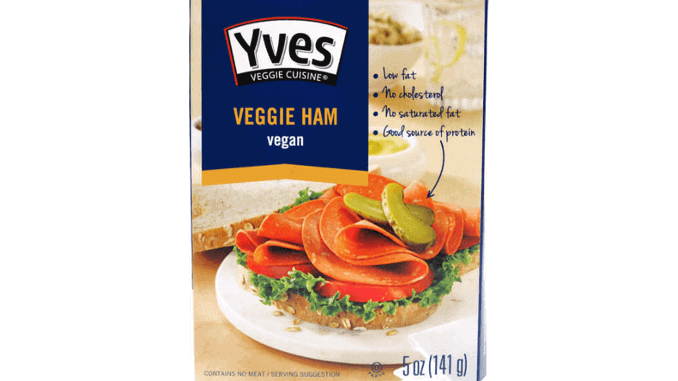 Yves has now introduced a new logo, packaging and marketing scheme as part of their mission to encourage Canadians to look towards plant-based ingredients. They are also working alongside influencers in North America to create innovative recipes incorporating the Yves ingredients. “We know that consumers want to eat healthier, but they don’t necessarily know how to do it,” said Goldenberg.